This octagonal tiny house was a design build project of Third Floor Corporation. It has field built cross laid laminated beams as wind bracing. The roof is both insulated and vented. It is heated by a small wood stove. The electrical system is a direct wired 12 volt direct current. The photovoltaic collectors power a marine grade electrical components and devices such as might be found on a small yacht. The house was designed as an isolated a writer’s study. It is about one half mile from the nearest hard surfaced road. 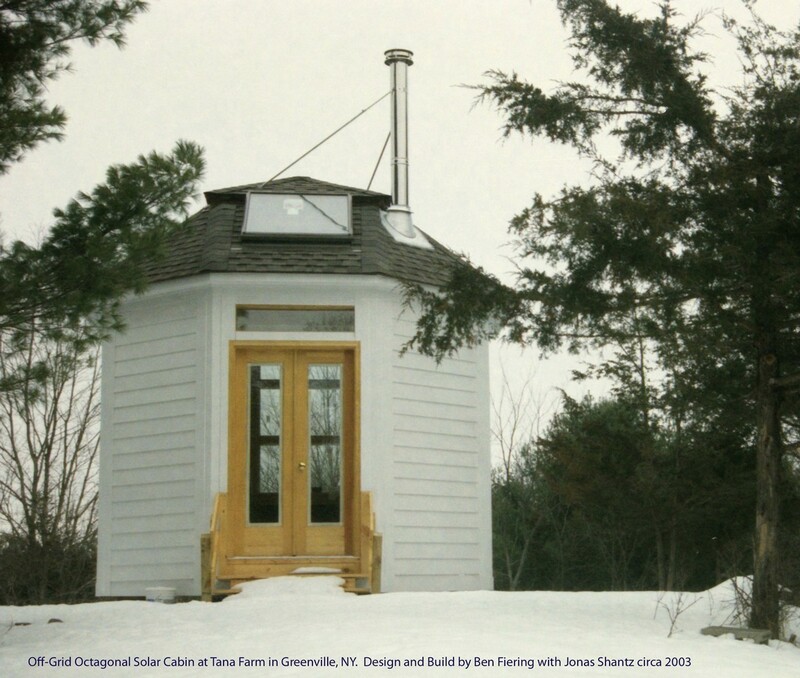 Off Grid octagonal cabin PV solar, with wood heat. Greenville NY. Next Article A review of finishing chemistry as applied to floors. In my experience the building department in Greenville was not difficult to deal with. I am not sure in what town or municipality you intend to build. Most of the building codes are written by the state, but they are administered locally. I am not aware of any specific minimum sizes, though there are other kinds of codes that relate to space. These are such as clearances in a kitchen, clearances around heating appliances, ceiling heights, fire egress, stair rise and run ratios, etc. How small is small to you? Is your plan to house a couple only? Would you want a room for guests? My year round house is about 900 square feet. It houses me comfortably but my office has to double as a guest room from time to time. I recently built a small house for a retired woman at about 1400 square feet. This was quite adequate with two baths a guest room an office space and an eat in kitchen-dining-living room. The tiny houses that I have done are less than 200 square feet. But these are one room situations and typically are not fully appointed in terms of amenities that one might expect in a full time year round house for a couple to share. I have never had difficulty with building inspectors as long as the work was well designed, clearly drawn, respectful of zoning concerns and impact on neighbors and as long as I was forthright with the building departments and open to discussing plans prior to the start of construction. Please feel free to get in touch with me directly by email doctorstructure@thirdfloorllc.com or give us a call at 914-263-6148. Thanks very much for your thorough reply, I appreciate it. The town of Greenville is actually our ideal place to build, if we chose to go that route. We’re looking for more of a “modestly sized” house (at about 800-1200 square feet, max) than a “tiny” house. Your place sounds ideal, as we’d like a minimum of two bedrooms (I have a home-based business, so I need a spot to work and store my merchandise.) I’m big on cooking, so we’d probably want to have a decent sized (or just have a decent amount of work space and storage) kitchen, and a living room big enough for the basics: couch, TV, maybe an armchair. Serviceable bathroom, maybe a half bath too, if we can swing it. Right now I’m still in the research stage, since our current house hasn’t sold yet. But with what I’m seeing available on the market for the past year, and our budget, I’m keeping an open mind as to our options. Jess, If you put a 600 Square foot plan 20×30 on a foundation that allows for a full basement and add a second story. This is an efficient structure to build. You can even add storage to an attic. I look forward to hearing from you when the time comes.